New Delhi: A nine member delegation from Florida International University (FIU), Miami, Florida, USA visited Amity University Haryana today to sign the Memorandum of Understanding (MoU) with Amity University Haryana, the idea is to setup the new ventures in the field of research and innovations and share knowledge. 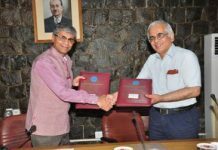 On this historical day, Dr. Kenneth G. Furton, the Provost & Executive Vice President; Professor of Forensic Chemistry, FIUand Prof P B Sharma, Vice Chancellor of Amity University Haryana signed the MoU. Also present were Dr. Meredith A. Newman, Vice Provost, Faculty and Global affairs, Professor of Public Administration, Dr. Padamkali Banerjee, Pro Vice Chancellor; Dean Academics; Director-Amity Business School, Dr. Gunjan M. Sanjeev, Vice President-RBEF; Director International Affairs also graced the occasion. Both universities will work side by side in the area of academics and research for the benefits of students as well as faculty members. 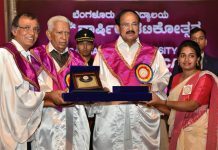 Signing the MoU will open up gates of the global knowledge for both the universities. This MoU will allow breaking the country barriers and sharing the quality education with each other as a result of an active interface with each other. Dr. Kenneth G. Furton, the Provost & Executive Vice President; Professor of Forensic Chemistry, FIU while addressing the gathering said: I am delighted to visit Amity to form long term relationship between two universities and explore areas of mutual interest. 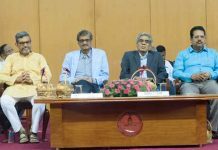 Dr. Padmakali Banerjee shared upon the need to identify areas for unconditional collaboration like faculty and student exchange programmes, joint research and publication, supervision and joint certification. She added that an outcome based approach needs top adopted if the MOU between the two universities is to be operationalized in the real level. During the discussion, Dr. Rajendra Prasad, Director, Amity Institute of Biotechnology, shared how common ground can be created for joint research, and collaboration in different fields of Applied sciences. Major General G.S Bal, discussed how cultural exchange be enhanced by exploring options of student and faculty exchange programs during summer and winter sessions. 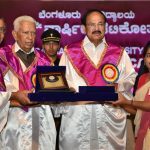 Other senior functionaries were also present from both the universities to grace the occasion and deliberate on creating opportunities in their respective disciplines. Dr. Meredith A. Newman, Vice Provost, Faculty & Global Affairs; Professor of Public Administration; Dr. Joanne Li Dean, College of Business; Eminent Scholar and Professor of Finance; Dr. Sumit Kundu, Associate Dean for International Programs, College of Business; James K. Batten Eminent Scholar Chair and Professor of International Business; Dr. Ranu Jung, Chair of Biomedical Engineering; Wallace H. Coulter Eminent Scholars and Professor of Biomedical Engineering, College of Engineering & Computing; Dr. De Etta Mills, Director, International Forensic Research Institute; Associate Professor of Biology; College of Arts, Sciences & Education; Ms. Sarah Noppen, Director of International Admissions; Ms. Birgitta Rausch-Montoto, Director, Faculty & Global Affairs; Fulbright Scholar Program Campus Liaison; Mr. Timothy Long, Multi-Media Manager, External Relations were present from FIU along with Dr. Arvind K. Birdie, Mr Bhupinder, Ms Balwinder and students.